Meetings. Ugh. Am I Right? If you think this way about meetings, chances are others do, such as the people you’ve called together to discuss a vital aspect of the project you’re all working on. Instead of dismissing meetings whole cloth, why not learn how to run them productively and maybe even have some fun doing it. That could change a lot of hearts and minds. It’s a process, of course, so let’s start at the beginning. Drop drab intros like, “You’ve probably wondered why I’ve gathered you here today.” Yawn. Just like a speech gets attention by opening with a joke, a meeting needs to open in such a fashion that it creates a cohesive group. So, what are some icebreakers for meetings? They should be collaborative. You can even use collaboration tools to help elicit ideas from the team members. Here are some fun ideas. Try them, and let us know what you think. If you have techniques that you’ve used, share them with us. Together we can make meetings less heinous! What’s the one word you’d use to describe yourself? Everyone picks one and then they’re referred to by that name throughout the meeting. It’s more than a silly way to start the meeting; it helps everyone get to know one another a bit better. Everyone should be constantly trying to improve themselves, and that includes on the job, so ask what one skill or talent each person would like to develop. It could be work-related, which helps you understand a team member’s interests and where they need help, but keep it more open-ended. That’s more fun. As the meeting settles, get people focused by asking what their favorite year is and why. Not only is this interesting, but it provides an avenue for people to know each other in a more intimate way. Everyone loves candy. Admit it! So, why not get a bag of M&M’s and pass them out. Whatever color the person gets means that they have to answer a specific question about themselves. You can have some fun figuring out what the questions are. Tell everyone in a very serious tone that you will not tolerate any smiling. Then tell a joke. See if people can keep a straight face. You might not be a comedian, but it’s harder than you think not to laugh. Chances are that within five minutes everyone will be laughing their faces off. That’s a good way to start a meeting, and you’ll find it a more effective one because of it. This is a game that was created by the Surrealists in which you divide a piece of paper in three, and then three people must draw the head, torso and legs, respectively, without seeing what the person before them drew. Inevitably, the final drawing is a hoot. So, break the group up into threes and have them get drawing as you set up the meeting. Who cares if they draw well or not? The worse they draw, the more hilarious the outcome. You’ve heard the old, “If you were stranded on a desert island what one book would you have with you?” Well, find out! It could be books, music, food, etc. Again, a silly ice breaker, but a real way to better know the people on your team. Ask each person to reveal the personality trait that is most irritating to them. It’s good for a laugh, though you might fear it could make for a disharmonious team. You’d be surprised, what appears might help you resolve conflicts before they occur. 9. What Kind of Car? If your workplace was a car, what kind would it be? Or you could tweak that to if you were a car, or if you coworkers were cars, etc. You’re probably seeing how these ice breakers are almost a stealthy way to analyze your team and work environment. 10. What’s Your Theme Song? Ask the team to imagine they’re in a movie. What song would play when they walk into a scene? Would it be a rousing number like in Rocky or maybe something more somber? You can use that information throughout the project to, say, play music when a milestone has been completed. Again, this has nothing to do with being artistic, but you can just have team members turn to whomever is sitting next to them and then have each draw a portrait of the other. People are not going to be especially happy with the results (no one’s likely to frame these pictures), but they’ll be playful, which is a great atmosphere to start a meeting. You can take the collaborative features of your project management tool to get the team working together on fun ways to start a meeting with remote teams. Have them create a chatroom where they can discuss the meeting to come. You might even send them an agenda, so they are thinking about what the meeting will be about. 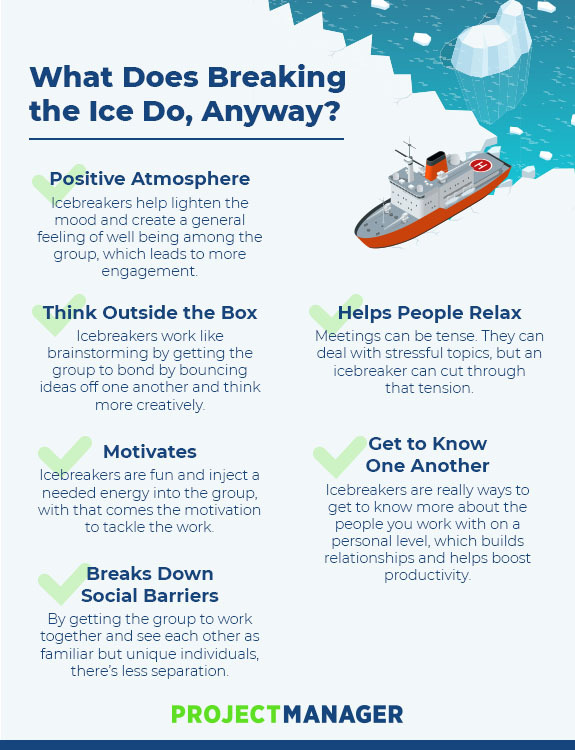 Then they have ownership of the ice breaker and buy-in to the whole meeting. It might seem like a dangerous door to open, but ask the team to be honest about their day. The Huffington Post says that, “the best business is done when you’re being true and authentic.” If nothing else, you’re sure to get engagement from the team, and that’s how you want to start a meeting, with a fully engaged room. While you don’t want to get people to divulge too much information, that could easily become inappropriate, it does help to humanize everyone if they share an embarrassing story about themselves. It helps break down barriers among the team and gets the group together and ready for the meeting. Yeah, it’s a bit morbid, but have everyone imagine they’re on death row the night before their execution. What would their last meal be? It’s good to do this at a pre-lunchtime meeting. Then, if you’re feeling generous and time allows, you might even treat the team to something from that list. Remove the chairs from the room in which you’re meeting and tell everyone that it’s a standup meeting. Not only is there evidence that standup meetings are more efficient, but you’re likely to have a faster and more productive meeting because people will get tired of standing around. Get everyone to the meeting on time by offering little prizes for promptness and silly prizes if they’re tardy. This can be an ongoing thing, where you even chart people’s wins and losses. It’s not to humiliate, but to motivate, and it might even create a more competitive and fun meeting culture at work. Hand out blank paper and ask each person to write or draw a short description of themselves. Then put all the papers face down in the middle of the table and go through them, trying to figure out who belongs to which description. You can do this yourself, which gives the team a chance to further bond as they work together to help you out. Write a fragment of a sentence on a whiteboard or a piece of paper or just say it aloud to the group. Now ask them to complete it. You can take this in any number of directions, from a project-related sentence, to a morale-related one or just something in a Mad Libs manner. Hide something in the room, maybe some money or the meeting agenda or something random, then have the team try and work together to discover it. You only can respond by saying they’re hot or cold when they search. Depending on how big your meeting room is, this might be an absurd assignment, but that just makes it a better ice breaker. Once the ice is broken and you have a team that is working collectively, you want to foster that collaboration with the right tools. ProjectManager.com is a cloud-based software that fosters teamwork. See how it can help them (and you) by taking this free 30-day trial. What Are Milestones in Project Management?